We know you'll love this	18cm copper sugar pan	as much as we do. 1107 customers found this review helpful. Did you? Yes, I did! A must for any sugar work. This pan is great for sugar syrups and caramels. It is only a small temperature difference that will change your caramel from being sweet and tasty, to being burnt and bitter. This is where the responsiveness of copper shines through, cooling quickly once taken off the heat. I use the pan often for sugar syrups when making macarons with the Italian method. This requires a small amount of sugar syrup. However, because of the size of the pan, I must tilt the pan to get the sugar thermometer to register correctly. Something to consider if you only work with small volumes of sugar syrup. Because the pan is unlined and copper is reactive to anything acidic, it is definitely a specialist pan. 1037 customers found this review helpful. Did you? Yes, I did! 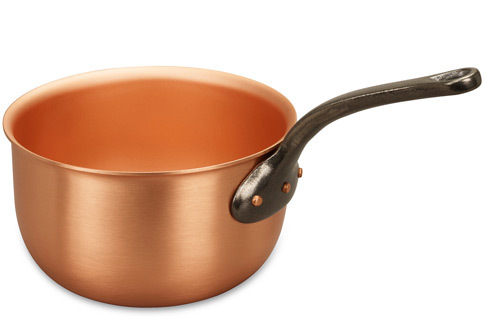 fantastic quality i have been looking for a copper pot for some time, but out of reach due to the price. Then i come across Falk Culinair, i purchased the pot thinking the quality may be lacking. how very wrong i was, just made our first batch of home made sweets my son loves them he tells me they are fantastic quality dad. Best birthday gift ever! If you like working with sugar this is a must-have! Absolutely terrific for managing the temperature. 955 customers found this review helpful. Did you? Yes, I did! Wow, OMG and other exclamations. Well, well, well. This is a serious step up from using stainless steel. I can't imagine using anything else ever again. 942 customers found this review helpful. Did you? Yes, I did! Sugar Pan As this has been bought as a Christmas gift for my son, he hasn't used it yet. The service from Falk was fantastic - very prompt delivery and excellent packaging. The pan is excellent quality and we are confident that it will be a once in a lifetime purchase for his career as a pastry chef. Looking forward to Christmas morning! 898 customers found this review helpful. Did you? Yes, I did! The unfortunate results of the inner pot being stained with black marks due to chemical additives in tap water. Mind to solve this problem. Great customer service. 841 customers found this review helpful. Did you? Yes, I did!